For a bit of traditional style in your bathroom, choose this beautiful vanity. The white marble counter and brown solid wood base make this piece great for any bathroom. Redo the style of your bathroom with this classic from Wyndham Collection. This vanity has both an all-around look and a traditional style. Its beautiful white marble counter and brown solid wood base bring a great new look into your bathroom. The simple look of the double-door cabinet and drawer is useful and classic. This set from Wyndham Collection is great for anyone looking for great style and function in their bathroom. Sheffield 80-inch W 5-Drawer 4-Door Vanity in Brown With Marble Top in White, 2 Basins With Mirror For a bit of traditional style in your bathroom, choose this beautiful vanity. The white marble counter and brown solid wood base make this piece great for any bathroom. Redo the style of your bathroom with this classic from Wyndham Collection. 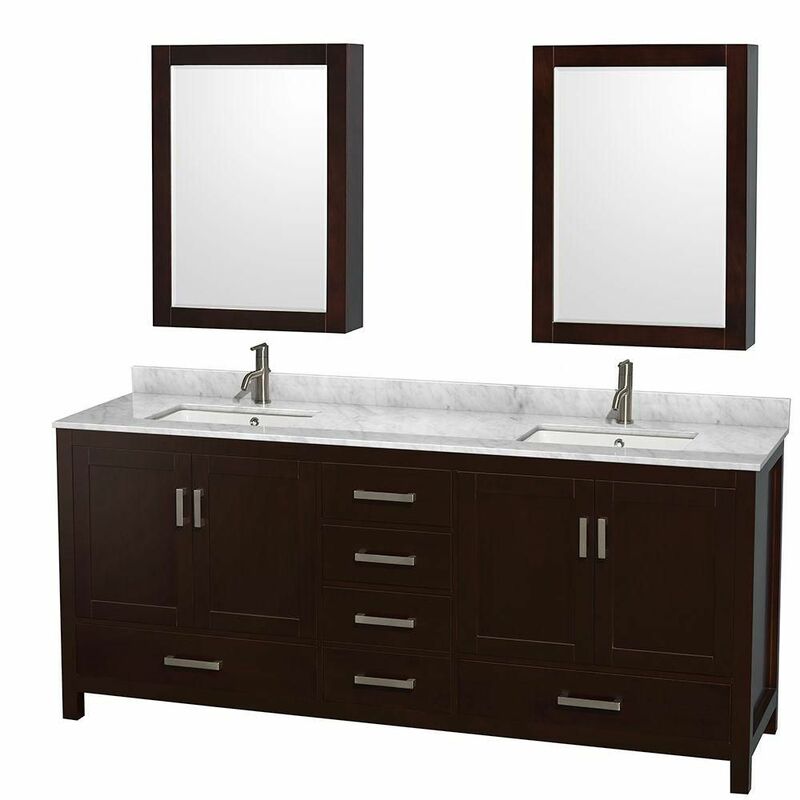 Sheffield 80-inch W 5-Drawer 4-Door Vanity in Brown With Marble Top in White, 2 Basins With Mirror is rated 4.0 out of 5 by 1. Rated 4 out of 5 by Zman from doesn't measure up This is a well constructed vanity made of plywood veneer with slow close hardward. It is heavy and required assistance to install. The counter top was beautiful. We gained storage space from the design. The problem was it does not measure. The description and the specification sheet indicates it is 80 inches. It is not - the cabinet measured 79 and the countertop measures 79 5/8. This caused astheical issues with fit. As a DYI, ireally don't have time to build twice. once as described and a second time for as delivered.